The problem with ascribing to history a “First German Empire” is not only blatant anachronism, but is actually somewhat more complex. It is firstly the attempt to rework the history of what actually occurred into a Nationalistic framework, in which National Empires, or Nation-states, figure as the driving forces of history, a narrative which both the proponents of Nationalism as well as its Leftist opponents accept unquestioningly. The Empire, the One, Holy, Roman Empire, with its genuine combination of Universalism and Localism, does not “fit” anywhere in the modern world. The history of the “Monarcha omnium regum et principum terrenorum” has been rewritten as a sort of “National Epic of the German Volk“. This leads us to the second facet of this complicated error, the idea of “the German Nation”. 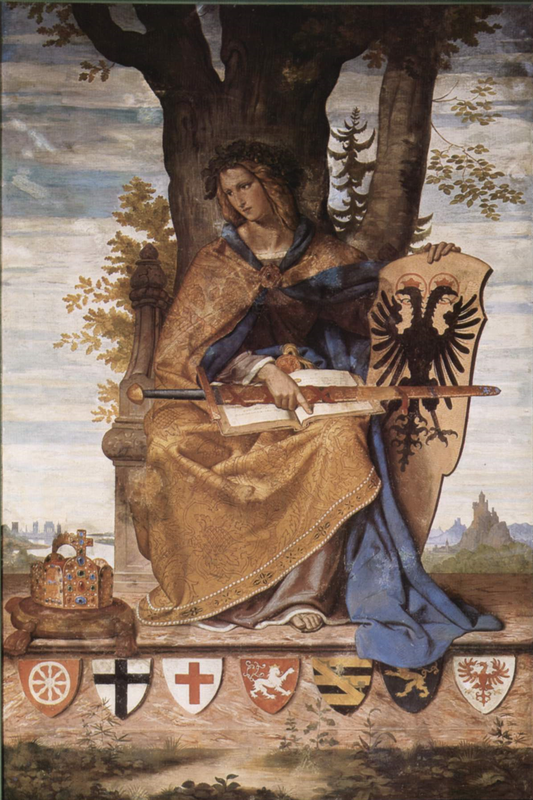 The idea that Holy Roman Empire of the German Nation was somehow the Empire’s official title (when it was in fact merely a Protestant slogan) is a popular misconception that has been laid to rest by such scholars as Peter Wilson (whose monumental work Heart of Europe I will be reviewing on this site) and Hermann Weisert. However the real error is the idea of the German Nation itself. The various peoples of the Empire not only held a distinct concept of themselves as a nation within the Empire, be they Czechs, Sayords, Rhaetians, but also the trifold distinction between the Nation, the Country, and the State as part of the Sacrétemporal world order. 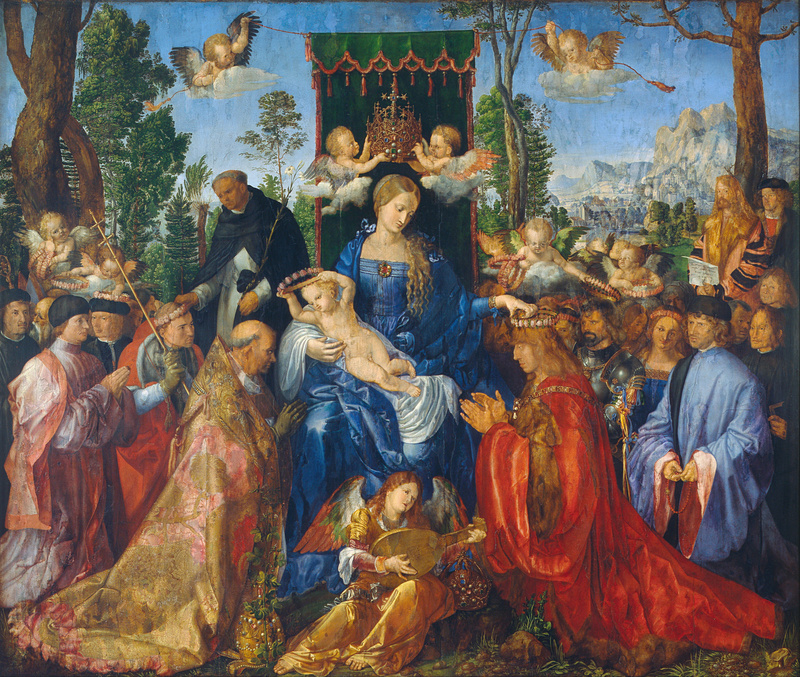 Thus Italia, Bohemia, and Germania were countries, while the nations that dwelt within them were Alemannians, Bavarians, Rhenish, Franconians, Saxons, Czechs, Silesians, Moravians, Tuscans, and many others. A nation might have an ancestral homeland, a regional heimat, in a certain country, but this was shared by other nations who dwelt there or who came to dwell there. Finally this error perpetuates the modern understanding that the concept of Empire is based on purely political-territorial criteria. It contributes to the continued existence of the idea of a succession of “empires,” the British Empire, the French Empire, the German Empire, the Russian Empire, the Japanese Empire, the American Empire… the list goes on. And perhaps it will go on indefinitely without getting any closer to the Truth that the Empire is One, the unifying principle of Civilization in itself. Independent of any territory or of any other political or geographical control, the Imperial title exists, the summit of legitimacy that has its source in the Author of all things and of true unity in true diversity. I am not sure what you are up to here, but I am very sure that the idea of an Empire predated Christ. You have the Assyrians, Persians, Egyptians and Carthaginians who all formed empires. I personally think that an empire could be good or bad. Although I must say that, were there to be an Empire, Christendom would be the best. I am skeptical of the idea that the Roman Empire is “the last empire”. Maybe it will be the last Empire in Europe, America, Australia and if God wills, some parts of the Middle East too. However, to say that it will be the last empire which incorporates the entire world is too far stretched. Perhaps it is too far stretched, but it was always the ideal of Catholic Civilization, and the ideal that I hold. These false ideas have a history. They were invented by 19th century German academics who also were committed “nationalists.” E.g. Theodor Mommsen. If anyone is interested in how the weird idea that there ever was a German nation, see the following. I. N. Wood, The Modern Origins of the Early Middle Ages. Oxford University Press, 2013. Kulikowski, Michael. Rome’s Gothic Wars from the Third Century to Alaric. New York: Cambridge University Press, 2007. These are only the most up-to date studies. There were earlier studies also. But Americans, for some reason, have no interest in history. Why this is, I don’t know; publishers never do market research. Would you recommend Peter Wilson’s book Heart of Europe? I would recommend it to someone who has a solid grounding in history. There are certain mistakes, and poor word choices (for example translating Latin servus as “slave” when it really means “servant” or “serf”), and some minor misunderstandings about Catholic beliefs (something to do with the reasons for the Crusades, if I remember correctly). However, it is the most comprehensive English-language resource on the subject, and if you’re up to reading a 900 page book (or if you just want it to reference), then I would recommend it. Ok, thank you very much for the information! 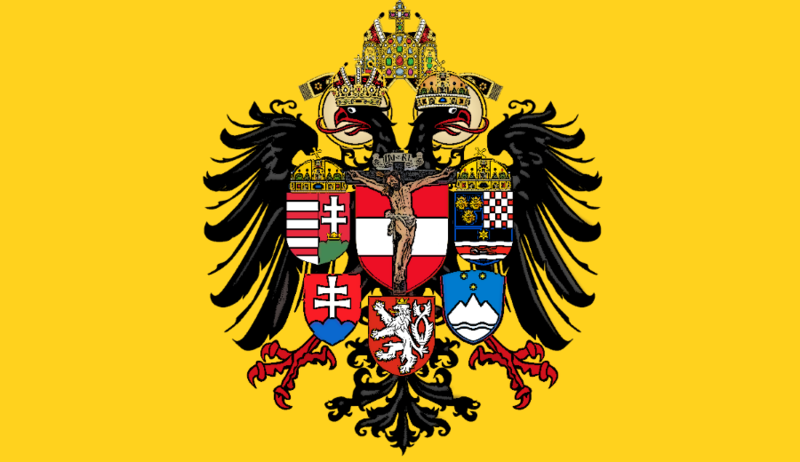 Brother in the faith, and in the cause (for my people was once subject to the Hapsburgs), I believe a couple of precisions regarding the universal empire may be pertinent. The difference between a king and an emperor resides in the fact a king rules over a single people (in an ethnic sense, thus “rex visigothorum” or “rex burgundiorum”, or “rex baiuwariorum”), while an emperor is he who rules over many peoples, including the king of each. That is why emperor Maximilian I von Hapsburg of Mexico took the title “emperor” and not “king”, considering the enormous variety of ethnic groups within the country, even though his ancestors had ruled over New Spain as “kings” (because the New World was then a part of Castille as a kingdom, though interestingly enough, Charles I [of Castille, V of the Empire] did sign documents as “king-emperor”). And thus, the title “emperor” may be validly used regarding other monarchs besides the Holy Roman Emperor, though he would be the only heir to the Roman Empire itself. As proof, we have Cortés’ “Cartas de relación” (written to Charles I himself) in which he attributed Moctezuma the title of “emperor”, since he ruled over many “kingdoms”, and was then still trying to incorporate the aztec “empire” to the Crown of Castille in a pacific manner (and he nearly got it). Also, we have the “imperio astur-leonés” as old as the IXth century itself. King Alphonse III of Asturias (866-910) was referred to by his children’s generation not as “rex” nor as “princeps”, but as “magnus imperator” or “imperator nostro”. When the court moved to León, king Ordoño II (914-923) appears in navarrese genealogy as “imperator legionensis”, and so do Ramiro II (930-950) and Ramiro III (965-984). The reason was that, by then, different kingdoms were beginning to be formed in the iberian peninsula, and only an imperial title legitimized the rule over more than one. Of course, those that used an imperial title in Asturias and León did it in derision of the Heristal’s claim to be the only emperors since Charlemagne, and were very conscious of it, using to their advantage the fact that the title “imperator” had been used in the past (still during roman rule) in reference to all magistrates who had “imperium” among their faculties, a remembrance of which was still then vivid in Spain for some reason. Álvaro d’Ors speculated as to why the kings of Asturias and León, ever since Alphonse III (not before), used the title as a challenge to the Heristal’s claim, even before the “translatio imperii” happened. He offered as a possibility the fact that in the iberian peninsula existed the idea that the only universal monarch could be the Christ himself, when He returned, and that any human claim to universal monarchy was a sign of the Antichrist, an attempt to usurp the Christ’s throne. The idea derived from milenarism, which has always flourished in the hispanic culture (the spiritual milenarism that was never condemned as heretical, the one prior to Joachim de Fiore). The Emperor as universal Monarch is not understood as usurping the place of Christ our Lord, rather he is co-regnant of Christ, subordinate to Christ’s Vicar, the Holy Father. In the words of Pope Boniface VIII, “Imperator est monarcha omnium regum et principum terrenorum”, “the Emperor is the monarch of all the Kings and Rulers of the Earth”, because he stands in the place of Christ the King, to preserve, defend, and restore Christendom until the Second Coming. It is because of this role that “Imperium” becomes a special kind of Authority possessed by the Emperor, and is essentially non-territorial. It is this non-territorial and Pontifically given Imperium, and the fact that the Empire which forms Christendom is based on the principle of subsidiarity, not of centralizing tyranny, that differentiates the Universal Empire of Christendom from the “Empire” of the Antichrist. Indeed many theologians of the Sacred Ages, including St. Thomas Aquinas himself, saw the Emperor as the bulwark against the reign of the Antichrist, and the last power to stand against it (and be defeated by it) before the Last Judgment.